It’s been a little over a year since I sat down to do a VyprVPN review. One of the biggest and most professional VPN providers on the market at the time and as of 2014, still in the same position. For those of you who are looking for a consumer VPN provider to protect your privacy, enable anonymity, allows access to region restricted content and more, VyprVPN is certainly one of the best choices out there at the moment. While it is true there are are handful of great VPN providers available, some of the others which we list on our VPN comparison guide, it is important to remember that not all providers are made equally, and in fact in a lot of cases, there can be many dubious providers, both in terms of the claims they make and the actual whereabouts of the supposed “company”. Fortunately VyprVPN are part of a larger network of companies and have registered offices with real staff, this enables them to offer support in numerous ways, one of the quickest being their live help system that allows you to resolve issues or ask pre-sales questions on the fly. They’re definitely one of the best VPN providers on the market. A lot has changed over the past year since I did my first VyprVPN review. On a personal basis, due to the nature of my work I have access to a range of VPN providers for review purposes and make use of them on a daily basis both at home and while travelling. Although I switch between various providers for a variety of reasons, one that I use more often than not is VyprVPN. The fact they have a range of custom software which is rather uniform across all devices is a definite bonus to their service. Switching between the Windows software and their VPN for Android software is effortless and the uniform design makes it uncomplicated to use. They also offer software for Mac systems and iOS such as the iPhone and iPad. One of the most interesting developments since I last publicly reviewed VyprVPN was the introduction of a new proprietary protocol exclusive to the VyprVPN service based around OpenVPN. While most providers offer connections via PPTP, L2TP and OpenVPN, which VyprVPN themselves do, a forth protocol was made available over the past year with the purpose behind it to enable a VPN connection to be made in locations around the world that attempt to block VPN use, namely the likes of Iran and China. The protocol certainly isn’t limited to being used in those locations and in fact will benefit anyone who is on a network that attempts to block VPN connections or who struggle to make connection via the usual range of protocols. However for those in countries with strict firewalls such as the likes of China then the Chameleon protocol is an ideal solution due to the fact it obfuscates your connection which in theory will make it impossible for the authorities or those who control your network to understand you’re using a VPN connection. Deep Packet Inspection (DPI) is used in countries such as China, but also others like Russia and Turkey to identify VPN connections, with the way Chameleon obscures the connection, added with the fact that how they do it is proprietary information makes for an ideal solution for those wanting to bypass restrictive firewall regimes. There has been much discussion over the past year about how to increase the privacy of users. Using a VPN is one thing but there are a few outside influences that can penetrate that privacy. When visiting a website, DNS servers are used to convert a hostname such as “VPNCompare.co.uk” in to an IP address that is read by machine. DNS servers look up the correct IP address for the hostname. Usually your ISP will provide the DNS servers that carry out such tasks but other public ones are available, from the likes of Google. 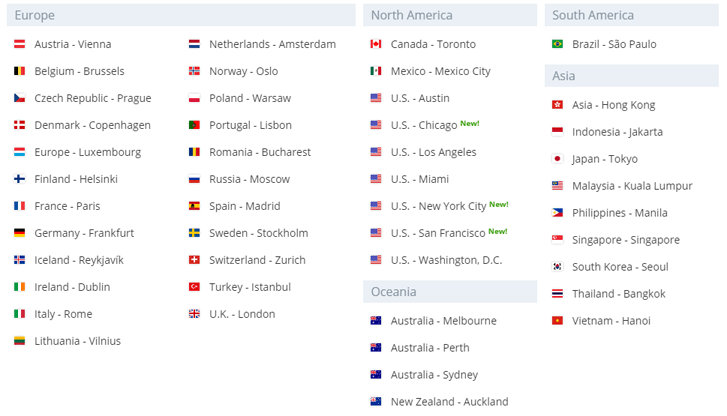 With an ever expanding network, it goes without saying that VyprVPN have been adding servers in various locations over the past year. One of the more notable is the introduction of a server in South America, namely Brazil. While new servers have not been springing up at a rate of knots, they have been consistent and most importantly, the servers introduced are all very fast and reliable. As the old saying goes, slow and steady wins the race. The USA has been well supplied over the past year with three new locations available in New York City, Chicago and San Francisco. A server is also now available in Mexico. New server locations are always a bonus and as mentioned earlier, considering the price hasn’t increased like most other things in life do, you’re getting more service for your money. 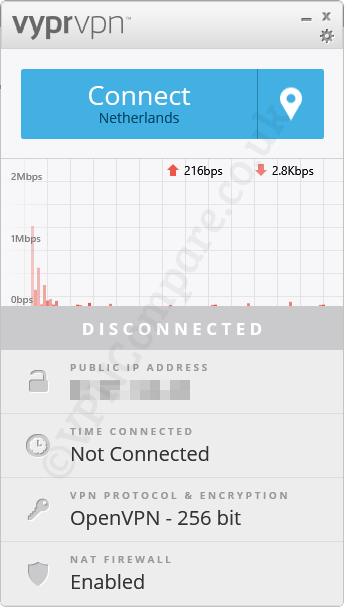 VyprVPN like many VPN providers log session data, this is basically a log of your connection and disconnection time, there are no actual details of your usage logged. This is kept to aid in criminal investigations, as we all know, a VPN is not a service to enable people to commit crime, but one to increase your privacy. One of the nicer changes is the time reduction that this information is stored. When I previously reviewed VyprVPN the information was stored for 90 days, this has been slashed to a mere 30 days. The above list is a condensed quick update of some of the more interesting new additions to the VyprVPN service, there are many more new additions that can be seen on their website. I intend to do a new full VyprVPN review in the near future but as it stands the new features definitely add further value to the service and provide more bang for your buck. One of the best VPN providers and one well worth considering.